I first heard about the idea, Tales to Tell, of accepting short stories from new writers in a contest, and compiling the best 20 in the form of a book, in the month of January. And my first reaction was that of delight. From the day I got involved into the Kolkata Bloggers community, I have seen them work towards new ideas. This was a great idea to promote the skills of writing and contemplation into the young people of our generation. After three months of accepting entries and sorting them to select the best few, the Kolkata Bloggers team started to find suitable young and new illustrators for each of the 20 short story. After the Hard work of over 8 months, the book finally got published, and was launched ceremoniously at an event in Oxford Bookstore, Park Street, Kolkata. The event was grace by the presence of eminent actor and author Barun Chanda, Oxford Bookstore’s Director, Maina Bhagat & Asiatic Society’s director Nirbed Roy. Though I couldn’t work on the book due to a family emergency at that time, it gives me immense pleasure to hold Tales to Tell in my hand today. 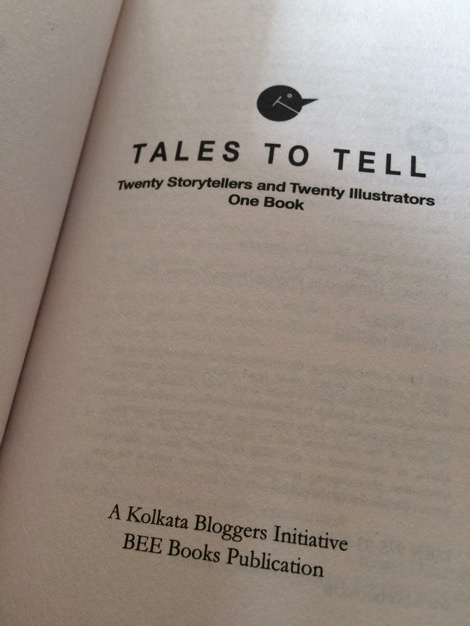 Now, coming to the book, I must say, that the team behind Tales to Tell, did a great job in sorting the best stories amongst the numerous entries. Being it their first book, a great editing job is done. There was not a single typographical or grammatical error that I could find. The stories are chosen wisely, and each short story has a different quality to it. The makers of the book have successfully captured different styles of writing while shortlisting the stories. There are even some stories which I had to read twice to understand the context and the depth to which it had been written. As the makers said, though the contest for submitting stories was open to people across all ages, the younger generation was the one from whom they got the maximum volume of submissions. This points towards a growing trend which is best for the coming generation. Coming to the illustrations, I am completely stunned by the amount of work that has gone into each illustration. Every illustrator of the book has followed an unique and legitimate style. The artworks produced are great, but could have been improved with the quality of printing. Some of them are unnecessarily dark, which often sent out a pseudo-message to me. In a book of 20 short stories, not all story is equal. Here are the stories that I liked and hated the most. Out of the lot, Chance by Aniruddh Roy, About Time by Ananya Mukherjee & Multiple bt Sagher Manchanda, were the stories that I liked the most, though other stories were good, these three managed to strike a chord in my heart. Amongst the illustrations, Algebra by Shuvam Lodh, Forever by Ritwik Kar, She Still doesn’t Know by Saswata Mukherjee, Multiple by Anusua Paul & Us and Them by Agnibha Sen, were the ones most visually appealing to me. Published by BEE Books, Tales to Tell, is unique, in its own accord. I am going with three out of five for Tales to Tell. In a world where young people are constricted to the internet all day, Tales to Tell brings an breath of freshness. Do give it a read. Published on September 8, 2015. Updated on September 8, 2015.